Review: A young boy goes in search of his lost dog and finds he arrives at an island to which all dogs have been sent after a ‘dog flu’ outbreak. This is a stop-motion-animated film set in Japan. I am not a huge fan of dogs so was rather worried that I would not enjoy it. 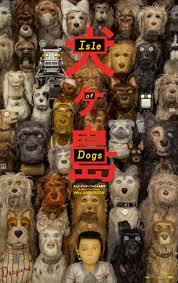 The title of this film “Isle of Dogs” could also be read as “I love dogs”. Even though this is a PG I do think that this is too scary for little kids to go and see. There were scenes that were very gruesome. It is not the lovely cute film that you may think it is if you just look at the poster. I did find this very funny at times. It is a visually delightful and emotionally touching film to watch. Bryan Cranston is brilliant in voicing the main role and the film contains a very good role for Scarlett Johansson. This is a very witty film containing lots of serious messages about our relationships with animals and also about our own free will and freedom in society. It feels like a fairy-tale but it is very dark. People who know Wes Anderson’s work will recognize his style in this film. The stop-motion was very well done. I have heard that instead of the animators moving the models every frame with this they did it every other frame. Apparently this was to give a more jittery quality to the picture. I love the way that they used the cotton (Alpaca) wool for clouds and explosions and cellophane for rivers and water etc. I found the animation amazing right down to the fur on the dogs and the way it rustles. I was struck at the amount of detail that has gone into making the film. Every scene is all so bright and colourful. I did have to laugh at all of the scenes where the dogs were fighting and thought it was brilliant. Well done to all of the modellers who were involved with the modelling of this project and everyone who works at 3 Mills Studio (East London). I did like the fact that all the dogs spoke English and the little boy spoke in his native Japanese. Loved the music which was composed by Alexandre Desplat, who has just won an Academy Award for his music on The Shape of Water, 2018. I also loved the different chapters and the way that the film was split up as the film went on. The movie was influenced by the work of Akira Kurosawa stop-motion Christmas specials. This is Wes Anderson’s eighth collaboration with Bill Murray. I have to say that this is my favourite Wes Anderson film so far. I love The Grand Budapest Hotel, 2014 but love this film even more. I did feel like I missed quite a lot of what was on screen because there was so much to see all the time. It is a film that I would quite happily go back and watch again I enjoyed it so much. The Japanese release date isn’t until May 2018. I enjoyed reading your review, and also think that the film was a visual feast and the attention to detail was amazing!